By leveraging upon our extensive market knowledge, we provide the best array of Ductile Iron MJ Collar. It is easy to use in any fabrication job for fittings. We make Ductile Iron Specials confirming to IS : 9523 suitable for Push on Joint, Flanged Joint Mechanical joint. We have our own State of Art manufacturing facility for the same having a monthly capacity of 300 Metric tons. The fittings are of various types and shapes. Please find below the list of the same. Ductile Iron Pipe Fittings BS: 143 are made of High Grade Steel for Strong, Durable & Total Safety under High Pressure Instalation. Common use of Steam, Air, Water, Oil, Gas and other Piping Installations, with working pressure up to 1000 Lbs. to 3000 Lbs. We are offering Ductile Iron Fittings that are designed at vendor’s end in compliance with IS-9523:2000. These fittings have very high tensile strength and are available in various dimensions. The ductile iron fittings, which we offer can serve utility as push-on joint fittings for both mechanical joints and push on joints. 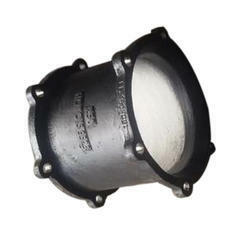 Ductile Iron specials and fittings as per IS standards from reputed manufacturers are available for immediate purchase. Being a remarkable enterprise, we are engaged in offering Ductile Iron MJ Collar. We offer Ductile Iron Grooved Elbow Fitting.